G.I. Joe has a new base of operations! IDW Publishing is proud to present an all-new era for the legendary Joe team. 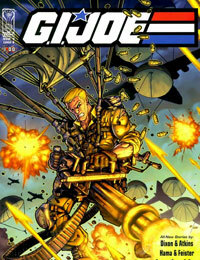 This specially priced introductory issue re-introduces the G.I. JOE vs. COBRA conflict for todays world, as presided over by G.I. JOE commanding officer, writer Larry Hama. Joining Hama on art chores is artist Robert Atkins. Together, the two tell their first tale-during a routine mission, the Joe team comes under attack by a mysterious outfit with terrifying goals.